I was just in Miami visiting a friend for a few days and having my priorities straight I traded days at the beach for food. Seriously weather was not that great but since I love food and Miami has a lot to offer in that area it was perfect. Since my friend knows me well, she recommended a few place for me to try, one of them was Sugarcane. The restaurant is located in the Wynwood/Edgewater area and is easily accessible from the downtown area or south beach. Keep your eyes open as you get near not to miss it as the name is on top of an iron fence covered with plants. It makes it tougher to spot but if you’re sitting on the front patio you’ll love the plant cover as it really cuts you off from the street and creates a beautiful garden environment. I chose a table inside as the patio was full but the decor is as nice inside. High ceilings with rows of fans a lot of wood and stone create a cool vibe to the place. This is a tapas style restaurant so you will have to order several dishes to create your meal and it’s ideal if you’re in a group as you will get to taste a lot of their creation. The menu is split in sections, first you have the crudo which as the name says is an assortment of meat an raw fish. You then have the small plates section that has a large selection of dishes. You then have the open grill section that offers vegetables, chicken, meat and octopus. They also have sushi and sashimi and the raw bar if you are in the mood for seafood. I chose four of those dishes picking the Hokkaido Scallops from the crudo menu to start. 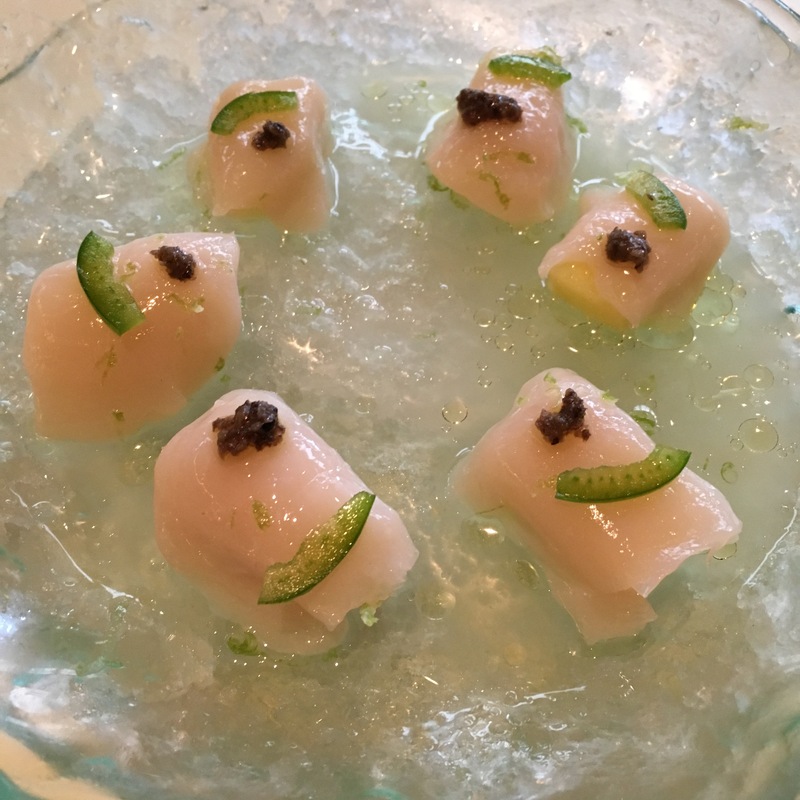 They were excellent, served on compressed apple with black truffle, lime and jalapeno the mix of apple and scallop with a hint of lime at the end was delicious. The Duck N’Waffle was also on my list as I just love duck confit and who doesn’t like chicken n’ waffle so I was sure this would be a hit. 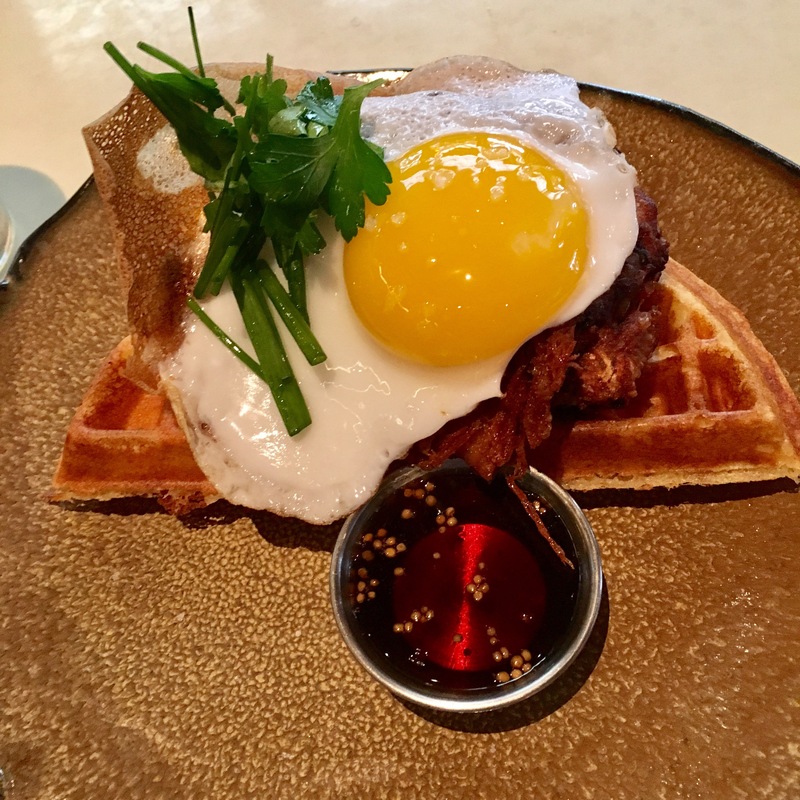 It turns out that it was the leg of duck confit served on the waffle and topped with a duck egg was also excellent. 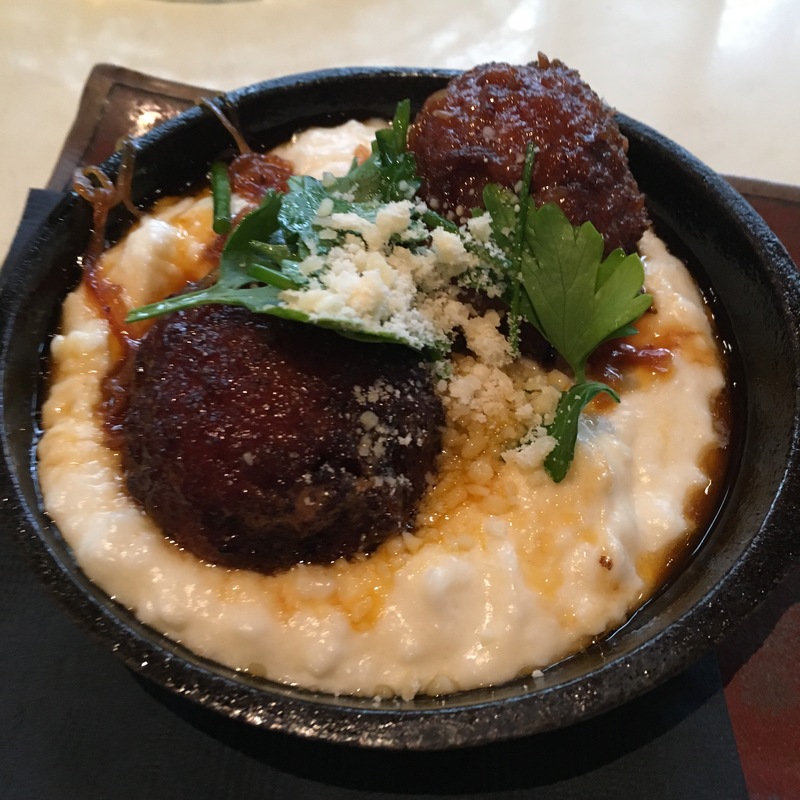 They had me at bacon when I saw the chicken an smoked bacon meatballs and I was glad I took them. They were served with golden raisins, marcona almonds and polenta. 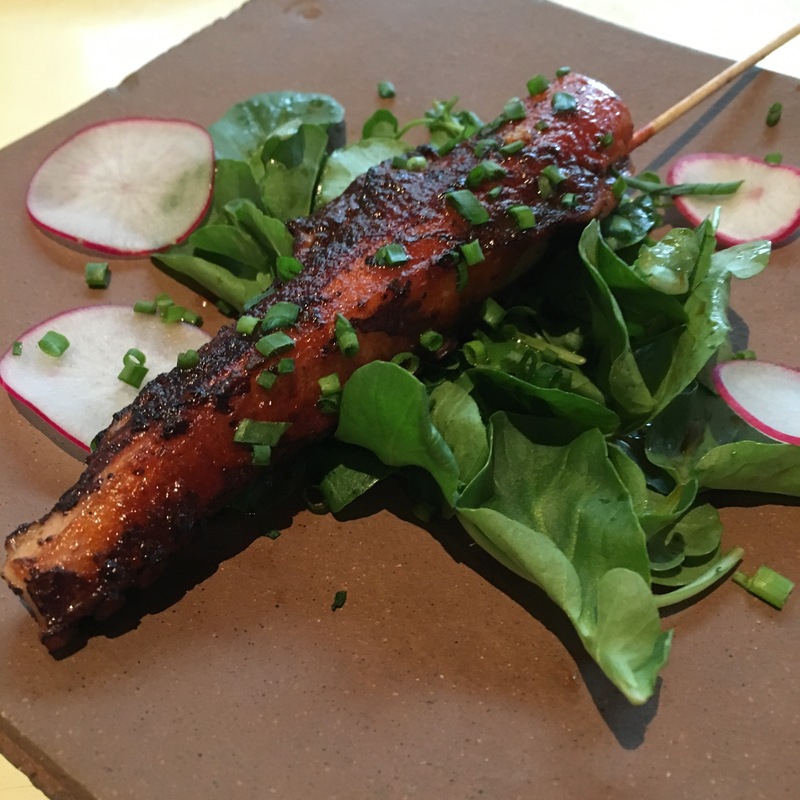 To be honest with you that would have been enough for me but I had also ordered the Octopus aji panca and I found some space to eat it as I just love grilled octopus. Overall all the food I tasted was excellent and I wish I could have tried some more. If you’re in the area definitely a place you need to go try.